News - Students Helping Children Across Borders, Inc.
A little more than a year ago, I came up with an idea for a project called Playing for Peace. I am proud to say that after 12 exciting, stressful and challenging months my project came to fruition and I am privileged to have had the most profound experience of my 21 year life. On May 27 I boarded a plane to begin what would be a three-day, three-flight, two-train, and four-bus expedition to the small provincial town of Suzdal, Russia. In the nine months prior I had designed and organized my project with Suzdal’s local government, founded a 501(c)3 non-profit organization, won the Davis 100 Projects for Peace grant of $10,000, fundraised an additional $15,000, and developed enough Russian language to hopefully survive on an isolated and poor provincial town on the other side of the world. I arrived in Suzdal with one goal: promote better wellness education and opportunities for kids, with regard to alcohol abuse and sports. The vision was to provide the facilities, equipment and materials to then work with the school faculty in establishing a comprehensive sports and wellness program for the town’s 500-plus grade K-8 students. I am proud to say that my vision came to fruition; however, not without many obstacles, crises and mistakes. Things got off to a great start when I arrived in Suzdal. The faculty loved the alcohol education posters, the 62 pounds of brand new sports equipment and my ambitious ideas for the project. We got right to work and after only a week we had made great progress in the construction. Students and teachers worked with me to design and install many elements of the new playground. In the mornings I ran a sports camp with the kids, where I got to foster some awesome relationships and engage in a tremendous cultural exchange about the various problems facing youth both in America and in Russia. In the middle of the project terrible weather arrived in Suzdal, along with logistic complications and a crisis in skilled laborers. At the end of June, my visa had expired and I had to leave Suzdal having completed about 90 percent of my mission. The finishing touches would have to be made without me, and I was very concerned as to who would keep the project rolling without the pushy American there to keep badgering construction crews and exciting the teachers. Weeks and weeks went by without any new developments. I was restless with anxiety over what was happening there. Communication challenges meant I had to put my faith in the hands of the very students that the project was meant to inspire. In the end, they responded strongly and proved that my presence had a positive effect by finishing the full project and even adding their own touches to the new schoolyard. At the end of the day, I may have dedicated a year to this new schoolyard but it was far from mine. Instead, it wholeheartedly belonged to the students and teachers of Suzdal, who proudly made it their own. The Davis grants are meant to promote peace and develop communities around the globe. Playing for Peace appears to have accomplished this as the principal writes to me often of how the community loves the new schoolyard and how the kids are responding very well to the wellness program. The success of this project is also not my own. I share it with the tremendous support that I received from my family, friends and Holy Cross community. In my organization, Joe Blundo (Babson College ’13) was the sail that helped me navigate the uncharted waters of starting a business, and my roommate/business partner Derek Kump’14 was instrumental in the development of this project and the winning of the Davis grant. Olga Partan, assistant professor of Russian, Cynthia Hooper, assistant professor of history, and Tony Cashman, director of the Office of Distinguished Fellowships and Graduate Studies, greatly supported me throughout both the planning process and the on-the-ground crises in Suzdal, answering frantic calls at 4 a.m. from Russia and even visiting the project (Professor Partan). I am greatly humbled to have had this experience and am deeply in debt to Mrs. Davis, my family, the project’s generous donors and the Holy Cross community. Jeffrey Reppucci ’14, from Newburyport, Mass., is a Russian major and member of the men’s ice hockey team. When Jeffrey Reppucci ’14 returned to the United States after an intensive six-week study abroad program in Moscow last summer, the Russian major could not stop thinking about what he had seen. “Even in the most sophisticated city of the country,” he says, “childhood felt overlooked.” This summer, Reppucci will return to Russia to battle that troubling reality as a scholarship recipient from the Davis Projects for Peace program. 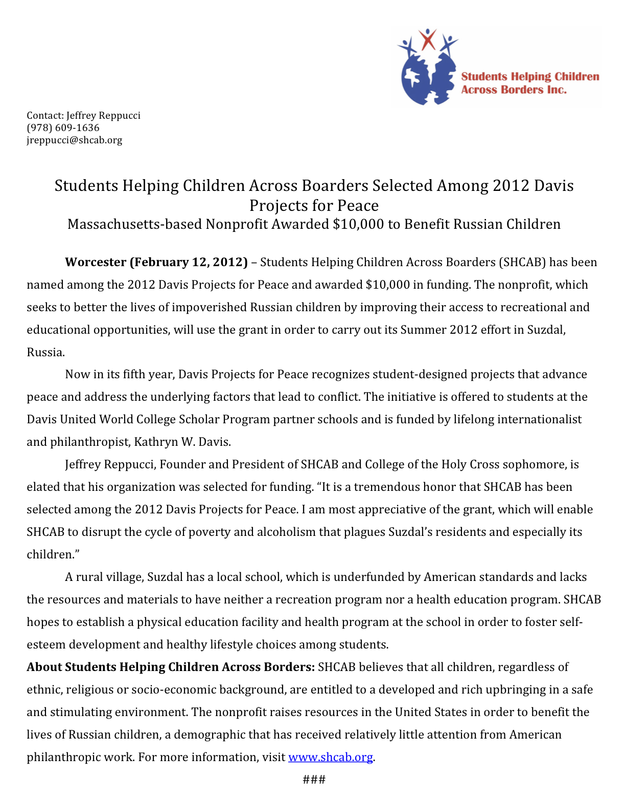 Reppucci, a Newburyport, Mass., native and defenseman on the Holy Cross men’s ice hockey team, was awarded a $10,000 Davis grant for his proposal to build recreational facilities and promote healthy life choices for children at a local school in a small rural area called Suzdal, about six hours east of Moscow. The project, titled “Playing for Peace,” will include the construction of a new playground, basketball court, and soccer field, as well as the donation of balls, jerseys, whistles, hula hoops and other recreational equipment. The second component of “Playing for Peace” involves the promotion of health and alcohol education. Russia today is plagued by rampant alcoholism, drug abuse, and high abortion rates. Reppucci’s research found that Russian children develop dangerous drug and alcohol habits much earlier in life than children in most other parts of the world. In addition to providing pamphlets and other educational materials, Reppucci will organize a community kickoff and ribbon-cutting ceremony in which the community will come to engage in a field day of games with the new facilities. Davis Projects for Peace was created in 2007 by philanthropist Kathryn W. Davis. The program funds 100 projects proposed by undergraduate students and select graduate students from around the nation, and put into action around the world. Reppucci says the project will be a collaborative effort. “In addition to working directly with the children of Suzdal, I will be meeting with teachers and administrators at the school to conduct a cultural exchange directed at how to best utilize the new equipment and organize after-school recreational programs,” he wrote in his project description. Reppucci has been developing the plans for his project with the mayor of Suzdal and the school principal for several months. Reppucci hopes the project in Suzdal is the start of a larger humanitarian effort to be carried out by his newly formed organization, Students Helping Children Across Borders, Inc. Created by Reppucci last October, the Massachusetts registered non-profit organization is aimed at making positive impacts on the lives of disadvantaged youths across the world. “My vision is to grow the non-profit into an organization spread across many college campuses incorporating students of language and culture all over the country,” he says. “Playing for Peace” will have a total budget of $30,000. In addition to the Davis grant, a governing body in Russia has donated $10,000. The remaining $10,000 will come from Reppucci’s own fundraising efforts driven primarily by the non-profit. To date, Reppucci has raised roughly $8,000 for the Suzdal project. He projects another $2,000 before he arrives in Russia on May 27 to break ground on “Playing for Peace.” The organization has raised this money through Facebook fundraising blasts, donations via its website, mail solicitations, and by sponsoring events both on and off the Holy Cross campus. “We are in the process of organizing a benefit concert for the project on campus involving Holy Cross’ singing and dancing performance groups,” says Reppucci, who also sings in the a capella group Fools on the Hill. Even as Reppucci’s return to Russia approaches, he already has his sights set on new projects for 2013.